Do you love art? Are you full with the creative ideas & artistic mind?….. then it will be like a cake walk for you to make your career as a graphic designer. Graphic design is a profession or art of visual communication that combines words, images and ideas to express information to the audience. Graphic design is also termed as Communication design & visual communication. Graphic designers create visual solutions to communications problems. Professionals who use different methods to combine words and images to create a visual representation of any information are called as “Graphic Designer”. Graphic Designer are generally employed in the web designing companies. They work quite closely with the web designers to give an awesome look to the images, web documents, videos and many other web applications. Graphic designer is a flexible job and many companies search for new and talented graphic designer these days. The term “Graphic Design” was firstly appeared in print in “New Kind of Printing Calls for New Design” by William Addison Dwiggins in the year of 1922. Logos, magazines, books, print advertisements, sign boards, posters and billboards are some of the examples of graphic design. Adobe Creative cloud and CoreIdraw Graphics suits are the examples of software package used in the graphic design industry. Adobe Creative cloud has three main programs which is used by graphic designer namely Photoshop, Illustrator and InDesign. These specialized computer software packages helps them to create layout and designs. A web designer should have knowledge in XML, HTML and basic web programming scripts. So are you ready to start your career as a Graphic Designer? 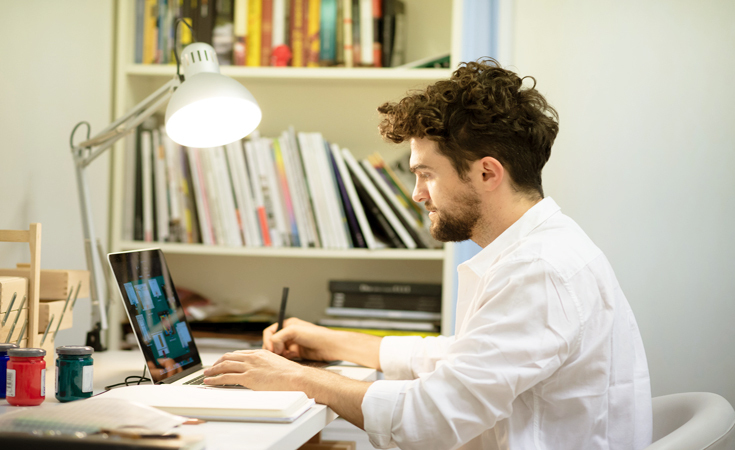 Along with pursuing professional courses in graphics design, Candidates can also take online education for learning HTML, CSS, Photoshop, and Web Design. Undergraduate Courses: If you are looking for admission in UG courses, you must have cleared at least 12th or higher secondary education from any recognized board. Postgraduate Courses: For admissions in PG programmes, you should have a bachelors degree in the related or equivalent stream. How to get a career in graphic design? Many government and private firms recruit graphic designers to work on different projects for several clients. You can also work as a freelancer designer in this field. Basic understanding of HTML, CSS and other web designing languages. Ability to meet the client requirements. You can easily find jobs in various design consultancies, advertising agencies, design studio, educational institutions, publishers, marketing firms and many other places. After completing degree in graphic design, you may also set up your own design studio or can work as an exhibiting artist. Develop graphic designs that meets clients objectives. Evaluate time and cost to complete graphic design. As a graphic designer, you can work in websites, advertising, books, magazines, posters, computer games, product packaging, exhibitions and displays. How much you will earn as a Graphic Designer? As a Graphic Designer in India, the average salary can be expected around Rs.2.5 lacs per year. With a good knowledge and creative skills in Dreamweaver and adobe after effects you can get a high paying job. In the USA, the average salary of a graphic designer is around $40 k per year. More talented and creative graphic designers will be able to make more earning in this field. If you have any other queries about Career As Graphic Designer, you can leave your comments below. Can we do graphics and animation UG course after doing 12th Commerce without maths? I am pursuing masters in English.so can I do this graphic designing course. Right now I’m in 11th std. you can pursue Bsc in graphic desiging and animation. Sir kya graduation hone jarori hai companies kae liyae phir designing ka diploma karo. will it be better to do diploma or degree course in graphic design? I just need to know, how much will it cost for me. Bcause i going to plan this as a new career. How many fees for this course? I want to know about b pham.